I know I wouldn’t have the opportunities that I do today if I hadn’t invested in these experiences early on. But at first glance it doesn’t always apprear to be in the budget and often times takes (calculated & prayerful) leaps of faith. Since the announcement of our own retreat this fall, we have been thinking about the sacrifice it takes financially and physically to invest in ourselves. 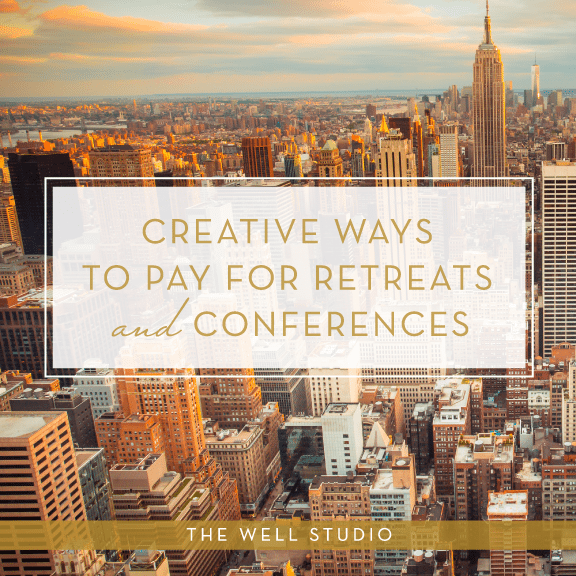 So we came up with a list of creative ways to pay for retreats and conferences. We would love to know your creative ideas in the comments below. 1. If you work for a company, church or organization, approach them about paying for the retreat or even part of it. Consider what you will be learning and how it would benefit your job. We have created a PDF you can download to present to them! 2. Let your family know you want money for your birthday. You would be amazed when you share, that some will want to invest even more in you and your dreams! 3. Clean out those closets and sell stuff online through Craigslist or apps like Offer Up or Wallapop or even facebook neighborhood groups and instagram. 4. If you are a maker, create something specifically to sell to raise funds. I don’t really consider myself a maker, but when I was raising funds to go to Africa last year, I got together with my sister and channeled my inner Martha Stewart and we hosted a little pop up shop! Don’t forget to share with people WHY you are making and selling and always think of upcoming holidays. 5. Are you an expert in something? Even if you don’t think you are, there is always someone who can learn from you. Consider teaching a class in your local area. You could even partner up with someone and offer a workshop, or even offer a consulting package. 6. Summer Camp – Parents are always looking for things for their kids to do. Create a one or two day summer camp. Partner up with a few other people to teach a variety of workshops. 6. Do you bake? Consider the holidays coming up. Let your friends know you will be selling baked goods for St. Pats Day, Easter, Mother’s Day, End of School, 4th of July. 7. Are you a photographer, stylist or designer? Create styled backdrops for families to do photo sessions – again, think about the holidays coming up, or even headshot sessions. 8. And there is always good ‘ole babysitting! 9. Start saving monthly – plan ahead. You will never regret investing in YOU. We would love to hear what ideas you have!!!! Share with us in the comments. Such a good idea! thanks for sharing!!! !